From beginner makes to more advanced techniques, community and charitable projects, groups and workshops - the WI has a wide selection of crafting activities to suit all abilities. 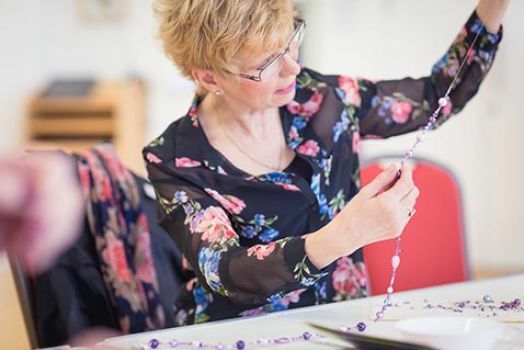 The WI is renowned for its craft activities, with workshops and events taking place at WI meetings, within federations, nationally and at the WI’s very own centre for learning, Denman. Some WIs even have their own dedicated crafting groups! Outside of meetings, WI members also have access to an array of craft projects, information and articles in WI Life magazine and on the new members-only website, My WI. The NFWI continues to work with external organisations, museums, universities and businesses to bring a range of collaborative projects to our members. Organisations the NFWI have worked with include: Crafts Council, Kingston School of Art, Salisbury Museum, ICHF Events, Crafts Beautiful magazine and Hobbycraft. Makes of the month - Brand new projects are added to My WI at the beginning of every month. Project library - A collection of projects, from sewing and papercraft to knitting and festive makes. Over to you - Read all about members crafting news. This month, members can have a go at embellishing motifs, crocheting a bed for their furry friend, and two alternative ideas for Easter gifts - dragee flowers and pyrography eggs. WI members can log-on to My WI, here. Did you know the NFWI is a Guinness World Record holder? In 2012, 3083 WI members gained the world record for the most people knitting simultaneously in one location. The members created nearly one kilometre of knitted links which have since been handed over to students at Kingston School of Art to upcycle into a range of unique accessories.